Ya know, we really are so incredibly spoiled as Patriots fans. All right, enough subtle bragging. Let’s get into the preview. Where to begin? Well, for starters, both teams feature top-five offenses which are capable of putting up a lot of points in a hurry, while their defenses sit near the bottom third of the league overall (the Rams are 19th in total defense and the Pats aren’t too far behind at 21). 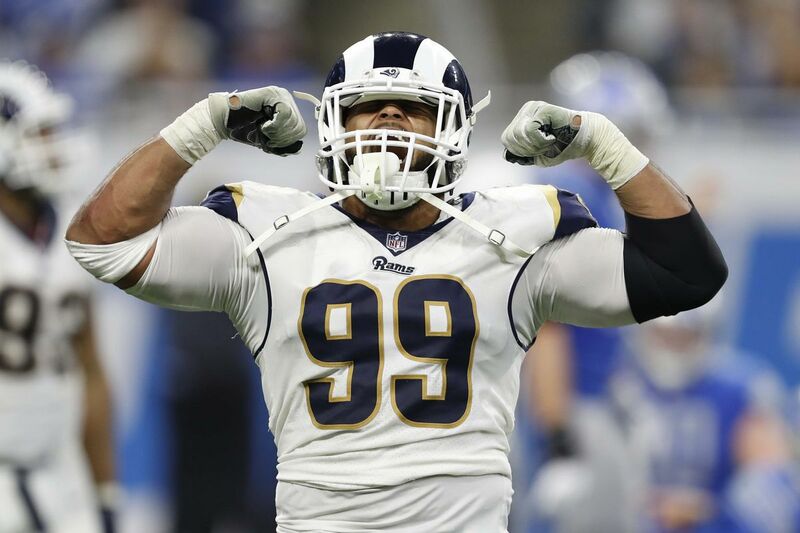 But that does not mean either team is a pushover on the defensive side of the ball; in fact, both sides have Pro Bowlers and/or All-Pros all over the field, including likely NFL Defensive MVP Aaron Donald (Rams), who, in all seriousness, might be one of the greatest defensive lineman to ever play the game. (I’m not kidding.) Don’t also forget that the Pats gave up the seventh-least amount of points per game in the league this season (20.3). More on this monster when we get to the storylines. Again, though, it’s the offensive side of the ball where these two squads really cut their teeth. The Rams were one of three teams to put up over 30 points per game this year (32.9) and can be very explosive; they had the third-most completions over 20 yards this season and averaged the second most yards per play (6.4), only behind Kansas City. The Pats finished fourth in the league with 27.3 points per contest, and their 5.9 yards-per-play mark isn’t all that far behind. The point is: both of these teams know how to move the ball and get into the end zone. But there’s one pretty notable advantage the Pats have over the Rams on offense, and it should be pretty obvious to even the most casual NFL fans. This will be Tom Brady’s 39th postseason game overall and the ninth time he’s played in the Super Bowl; Jared Goff will be playing in just his fourth playoff game and his first-ever Super Bowl. In fact, Brady has played in as many career postseason games (39) as Goff has played overall career NFL games when you combine regular-season and playoff appearances. Goff looked petrified the whole time the two were up on stage together Monday night. There’s also the whole coaching experience the Pats possess as well. Again, much like Brady, I don’t think I need to waste time waxing poetic about how Bill Belichick is the greatest coach of all-time or talk about how he’s 34 years older than Rams coach Sean McVay, who is only in his second year of running the team. But, as I already pointed out last week, the fact that Belichick has been coaching in the league for over a decade longer than McVay has even been alive is INSANE, and it could certainly present itself as quite important in the game’s biggest moments. A fully healed and rested Gurley is capable of taking over any game at any time. Even if Gurley doesn’t show up, the Rams have C.J. Anderson, who apparently signed a deal with the Devil this winter. After a 1,200-plus-yard effort with Denver last season, Anderson was let go, and for some reason it took forever for him to find a new home. He then signed with Carolina and struggled through nine games as a backup before being cut in early November. Then, just before Christmas, the Rams signed him due to Gurley’s health, and he’s responded with three 100-plus-yard rushing efforts in four games so far, averaging 5.68 yards per carry! The Rams also have Robert Woods and former Patriot Brandin Cooks as a very solid wide-receiver pairing. Both guys had at least 80 catches, 1,200 yards, and five TDs this season, and they’ll make it tough for the Pats’ secondary to decide who to focus on. (QUICK PREDICTION: The Pats will likely bracket Cooks with one safety over the top due to his deep-threat ability, basically nullifying him as a weapon. In turn, Goff will have to force the ball to Woods more often than he’d like to, causing a costly interception or two.) As I said, it’s no longer a three-headed monster with Cupp out, but Josh Reynolds has still been a decent No. 3 option who is averaging over 18 yards per catch this postseason. As far as tight ends go, they’re pretty unimpressive in that department, and the Pats should be able to lock them down with ease. Old friend Cooks will be looking to actually play in the entire Super Bowl this time around. (Rams D-Tackles vs. Pats O-Line): I mentioned Aaron Donald at the top of the piece, and yes, he really is THAT good. He compiled 37 sacks through his first four seasons while also proving to be a force against the run, immediately proving himself to be one of the league’s top defenders after being drafted in the first round out of Pittsburgh in 2014. This season, though, he hit other-worldly levels, posting a league-leading 20.5 sacks, which is even more impressive considering he plays mostly from the interior. Michael Brockers has also been an underrated tackle for years, and let’s not forget the Rams also added former All-Pro Ndamukong Suh to the mix this year as well. Other than these guys, though, the Rams aren’t really all that scary up front (though defensive end and former No. 3 overall pick Dante Fowler can be good in spurts). 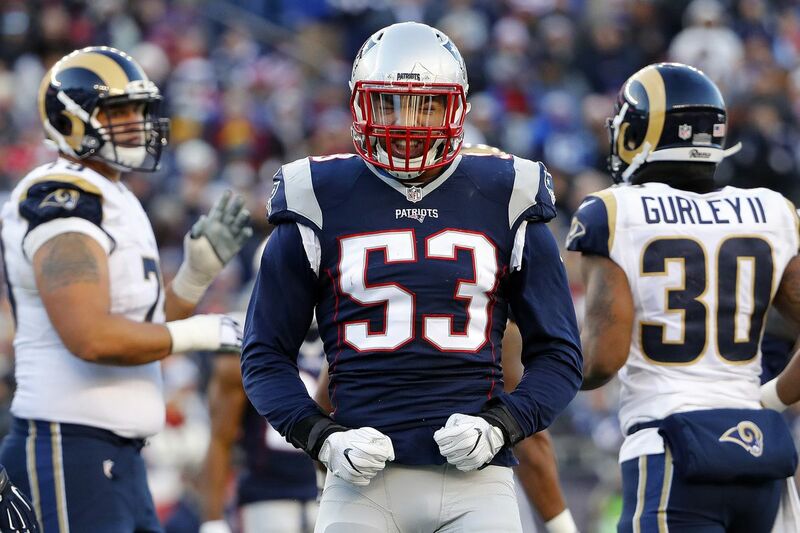 Luckily, though, the Pats O-line has been even better, allowing zero sacks this postseason. As ferocious as Donald is, I’m really not worried about the Rams’ pass-rush in this one. The Pats O-line has truly been exceptional, but they haven’t played this guy yet. (Pats Running Game vs. Rams Front Seven): The Pats were able to use all three of Sony Michel, James White, and Rex Burkhead against Kansas City, who collectively give them the best stable of backs they’ve had in years. While Michel is undoubtedly the grinder on the ground, the Pats can keep the Rams off balance with a mix of the other two catching balls out of the backfield. The Rams run defense has been a bit inconsistent this year; they kept guys like Ezekiel Elliot, Alvin Kamara, and Mark Ingram to a total of just 98 rushing yards this postseason, but they’d also given up over 100 ground yards in nine-of their-last-10 before that (including one where they surrendered 273 [!!!] and another in which they gave up 194). They also gave up the highest yard-per-carry average (5.1) to opponents this season. Knowing how good the Pats’ pass-blocking has been and the success they’ve seen with running the ball lately, the Rams will probably focus more on stopping the run. Believe it or not, even as bad as the Rams have been against the ground attack this year, I’m still expecting this one to set up much better for White and Burkhead as opposed to Michel. Cory Littleton (125 total tackles) has also been a revelation at linebacker for L.A. this year, and he could be the X-factor for them on defense in this one. (Rams Running Game vs. the Pats Front Seven): I already mentioned how the Rams feature not only the game’s premier running back in Todd Gurley, but they’ve also received some unreal production out of C.J. Anderson lately as well. Whether Gurley is fully healed and rested in this one or not, Anderson has proven to be more than capable of carrying the load. The Pats have struggled against running backs at times this year, allowing 4.9 yards a tote, but they’ve given up just 60 rushing yards in total this postseason and a total of just 176 combined in the last two games of the regular season. However, Gurley can hurt them as a receiver out of the backfield, which is perhaps the Pats’ biggest area of weakness on the defensive side of the ball. In fact, Chiefs running back Damien Williams posted a solid five-catch, 66-yard, two-TD performance against the team less than two weeks ago. Dont’a Hightower, Elandon Roberts, and Kyle Van Noy are going to need to step their game up big time in this one. Van Noy has been one of the team’s best pass-rushers and all-around defensive contributors this season, but he leaves a lot to be desired in terms of pass-coverage. A LOT. (Watch out for “Greg the Leg”): The Rams have one the league’s top kickers in Greg Zuerlein. He missed a couple games with an injury this year but has otherwise been money for the past three seasons, nailing 90 percent of his attempts over that time (including 95 percent of them last season). Not only is he accurate, but he’s got an incredibly powerful leg that pretty much puts the Rams in scoring position any time they’re on the opponent’s side of the field (10-for-13 on 50-plus-yarders the past two seasons). If the game’s close at the end and the Rams have the ball, this dude could end up being the dagger that takes down the throne. This guy can seriously kick the ball to outer space. While both teams are pretty close in terms of talent level, I feel like experience will end up being the key to victory here. Again, I know the Eagles had a first-year head coach and a backup quarterback win them a title last season, but the Pats defense was also really, reaallllyyy bad in that game. This year, they’re much more refined on that side of the ball, and the Rams aren’t playing at full strength. Above all, I just can’t see Jared Goff beating the G.O.A.T. coming off a Super Bowl loss. I just can’t. Edelman, White, and an adrenaline-filled Gronk will lead the way on offense, and the Pats end up winning with a bit more ease than expected, 34-27. AND DON’T FORGET: Be sure to tune in on Facebook Live this Sunday from 1-3 p.m. – or come hang with us at Oak Square Liquors in Brighton – as The 300s crew brings you our first-ever LIVE podcast, giving you even more predictions, insight, and crazy shenanigans until just hours before kickoff! 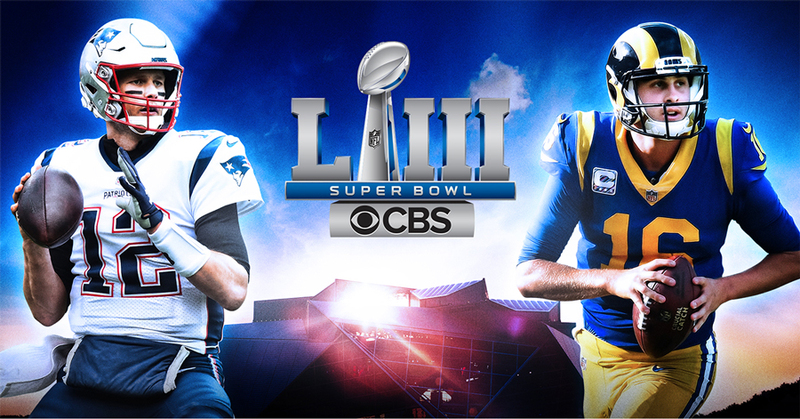 This entry was posted in NFL, Patriots and tagged Bill Belichick, Jared Goff, Julian Edelman, Los Angeles Rams, New England, New England Patriots, NFL, Patriots, Patriots Rams, Pats, Pats Rams, Pats Rams Super Bowl, Rams, Sean McVay, Super Bowl, Super Bowl LIII, Super Bowl LIII Odds, Super Bowl LIII Predictions, Super Bowl LIII Preview, Super Bowl Odds, Super Bowl Predictions, Super Bowl Preview, Todd Gurley, Tom Brady. Bookmark the permalink.